House Telvanni is one of the Great Houses of Morrowind. It governed the Telvanni District of eastern Morrowind, and administered the eastern portion of the Vvardenfell District from its council seat in Sadrith Mora. The house comprises mainly highly egocentric and ambitious mages, and is known to many as the house of the master wizard. Here, it was common to rise through the ranks by eliminating or otherwise 'indisposing' other members. Of the Telvanni lords, only Master Aryon of Tel Vos seemed able to look beyond the end of his own nose and at the concerns of other people; the rest wanted little more than to be left alone to their research and ambitions. The other members were similarly isolationist in outlook and did not intend to be presided over by any of the other institutions, predominantly the Guild of Mages. The Telvanni, in general, did not interact with other Houses or Guilds, nor did they have many enemies save for Abolitionists and the Imperial Mages Guild. In the Second Era, they refused to join the Ebonheart Pact, much to the chagrin of the other houses. On the other hand, the Telvanni did not have the usual hatred of vampires that most other factions had, and some of their lords and Mouths were willing to speak to them; wizards did not fear vampires nearly as much as others did. All of the Telvanni Councilors on Vvardenfell lived in great towers (which required levitation to ascend), with one leader in each of their main towns: Sadrith Mora, Tel Aruhn, Tel Vos, Tel Mora, and Tel Branora. None of the Telvanni towns were on the Silt Strider routes; the only transport available to them was by boat, except for Sadrith Mora itself. Being the only Telvanni town with a significant Imperial presence, it could be reached by Guild Guide from another Mages Guild to the nearby Imperial-controlled Wolverine Hall. On the mainland, House Telvanni lands included the city of Firewatch, east of Tel Mora, and Port Telvannis, located on the islands to the northeast of the mainland which extend out into the Padomaic Ocean. The city of Sadrith Mora was the district seat of the Telvanni on Vvardenfell, even though the Archmagister, Gothren, did not live there, but resided in nearby Tel Aruhn. Sadrith Mora was home to the Council Hall, in which each Telvanni lord was represented by a lieutenant with the title of "Mouth". In general, the actual lords themselves lived in their own towers and did not attend the Council. Even Master Neloth of Tel Naga, who resided nearby in Sadrith Mora, did not attend the Council. Some great Telvanni opted out of the rat race for power within the Council entirely due to their isolationism. But, among those who actually cared about who the leader was, the ever-procrastinating Archmagister Gothren of Tel Aruhn, few ever voiced their opinions. House Telvanni was among the staunchest defenders of slavery, which they saw as an ancient Dunmer right. Their ideals and desires, evidently not concerning themselves, were left to the slaves to obey. However, both Khajiit and Argonians, the two most common slave races, could join House Telvanni and advance with the same level of respect as other races. Many of the towns, notably Sadrith Mora and Tel Aruhn, housed slave markets. Telvanni holdings were also worked by slaves, whereas the other Great Houses preferred to use generic workers. Unsurprisingly, Telvanni were strong enemies of abolitionists. During the Oblivion Crisis in 3E 433, the Telvanni did their best to close the Oblivion Gates on Vvardenfell, but it was to no avail and the Daedra swarmed the land. During the same year, a Telvanni Arch-Mage Frathen Drothan turned rogue and gathered a band of mercenaries called the Drothmeri army in an attempt to topple Imperial rule. He led an expedition to Sundercliff Watch in the Valus Mountains of Cyrodiil to search for Mehrunes' Razor, but he was slain by the Champion of Cyrodiil before he could retrieve the artifact. The Telvanni suffered greatly during the Red Year in the early Fourth Era. All of the settlements on Vvardenfell were obliterated, but the Telvanni survived and attempted to rebuild. Morrowind was then invaded by the Argonians of Black Marsh, and in an act of revenge for centuries of slavery, the Argonians focused on wiping out the weakened House Telvanni. Circa 4E 6, the last remaining stronghold of the House was sacked by the Argonian invasion force and Great House Telvanni fell. It is documented that some survivors attempted to flee aboard The Pride of Tel Vos, a ship which was later found wrecked along the coast of Skyrim, east of Winterhold. By this account, a single heir of the house survived: Brandyl Tenvanni, son of Lymdrenn Tenvanni, who was found as an infant by Argonians. He grew up in Black Marsh under the name Brand-Shei. Brelyna Maryon is also a descendant of House Telvanni. There are surviving, or new, Telvanni mage lords who still have holdings on Vvardenfell, although it is unknown what or where they are. In 4E 16 the King of Skyrim sympathetically gave the island of Solstheim to the Dunmer refugees. Neloth had also traveled there to research the ash deposits from Red Mountain, bringing much of Morrowind's exotic flora and fungi to the now partially ash-damaged island. During his time there, he has been studying Heart Stones, fallout originating from the center of Red Mountain, and has learned how to use magic to weave living things from the ash. By 4E 201, Neloth had finished growing the settlement of Tel Mithryn on Solstheim. Though the people of Solstheim view him as possibly mad, he was still well respected by the other Telvanni wizards. He often took apprentices, though he used them in painful experiments more often than he actually taught them. Neloth planned on returning to Vvardenfell after finishing research on the Ash Spawn, which started to appear on the island after the Red Year. Tel Mithryn and the Redoran-governed city of Raven Rock remained cordial, with the two settlements content to ignore each other. 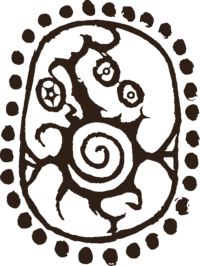 A banner displaying the sigil of House Telvanni. 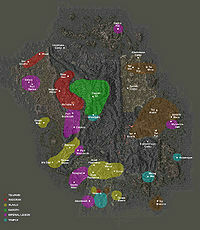 For more information, see the Morrowind article. ^ Dialogue in Morrowind during the Hortator and Nerevarine quest, after receiving Wraithguard from him and inquiring about "people of Morrowind". ^ Rumor in Oblivion: "I have heard things are bad in Vvardenfell. The Telvanni do their best to close the gates, but it is to no avail." This page was last modified on 15 November 2018, at 21:43.